Bamburi Traffic Base Commander Abubakar Bakari putting a face to Traffic Police corruption during vetting by National Police Service Commission team led by Johnstone Kavuludi about source of his wealth estimated at Ksh50 million and huge M-Pesa and bank transactions. Traffic police officers had a difficult time explaining huge amounts of money and transactions in their M-Pesa and bank accounts for the last three years, as the National Police Service Commission started vetting them. Traffic police is the face of corruption is a service that continues to resist reforms by bankrolling their seniors with millions of shillings to get favourable treatment including transfers to lucrative stations as well as retention in stations that offer huge sums of money in bribes from PSV and commercial transporters. A low-rank officer as Chief Inspector in particular, who said he is worth Ksh50 million, was hard put to explain how he acquired his wealth and huge M-Pesa transactions in his account is a short span of three years. Chief Inspector Bakari’s M-Pesa transactions showed that he was sending huge amounts of money to his seniors in Western Kenya. It is common knowledge that Traffic cops have always bought their promotions and transfers to lucrative stations, like weigh bridges, with proceeds from Highway Corruption. 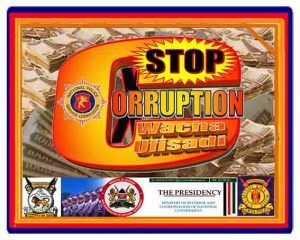 President Uhuru Kenyatta has been hopping from one police formations training institute to another pleading with NPSC and senior officers to curb corruption but his pleas seem to fall on deaf ears. No senior police officer has been prosecuted even when the NPSC establishes many have been corrupt or committed serious crimes punishable under both Kenyan laws and international laws. They are told to go home offering them the opportunity to devote their energies to the multi-billion-shilling crime industry full time. Bakari, now the Bamburi Police Base Commander, could not convince the panel led by commission chairperson Johnstone Kavuludi that the money he was sending to his bosses was from a merry-go-round. The officers were also asked to explain several complaints lodged against them by the public and junior police officers. Bakari who has been in the force for nine years was asked to explain about other huge amounts of money that was being sent to his M-Pesa account by his juniors. He explained, unsuccessfully, that some of his seniors opted to use junior colleagues to send the money to his account. The officers, Bakari claimed, had chosen him to collect the “merry-go-round’’ money. “We had been having merry-go rounds with 13 base commanders when I was in Webuye. In that chama I have been the collector and that is why I used to send money and receive as well. All those transactions were made during that merry-go round,” Bakari told the panel sitting at the Kenya School of Government in Mombasa. Further pressed to name the officers he was doing the merry-go round with, Bakari could not even attach five of his fingers to the chama friends. His M-Pesa transactions showed that the officers sent money from Bungoma, Busia, Kakamega. Webuye, Kabras, Nairobi among other areas. Bakari was previously stationed at Webuye. During the hearing, Kavuludi warned him three times against being rude and interrupting the commissioners while they were probing him. Rudeness is a regular compliment of the corrupt in all fields. Bakari knows the worst that can happen to him is to be sent home like his senior colleagues – not jail. In any case there is no foreseeable day that NPSC will give Ksh 50 million as retirement benefit to traffic cops. Police officers own some M-Pesa outlets just like they own PSV matatus to cover sources of money. Some of the M-Pesa outlets belonging to police are registered in names of shell companies in relatives of other fake owners – some of them are reportedly registered using dead people IDs, which are plenty in police stations. He was given 14 days to supply the commission with detailed M-Pesa and bank transactions after he said he was a farmer who supplied ‘‘chicks” to some of top hotels at the Coast. Chicken appears to be a popular commodity in corrupt deals in Kenya. Within those two weeks, Bakari has also been directed to submit to the commission a mobile phone number that he has been transacting with and which he denied knowledge of and to name members of the said merry-go-round. But the policeman defended himself claiming the man was a member of their chama. Bakari, who comes from Kwale County, said that his wife was a businesswoman and at times, they get tenders from the county government. He said the two were directors of a company which currently has been awarded a Ksh4 million tender by his county government for construction of an Early Childhood Development Centre (ECD). He told Kavuludi that he expected the Ksh4 million to be in his account by the end of the week. “Chair, I cannot do without M-Pesa. We have a business with my wife and sometimes we withdraw up to Ksh500, 000,’’ said Bakari. Asked by a commissioner, Ms Mary Owuor, why he had four bank accounts with including Standard Chartered, Kenya Commercial Bank, Police Sacco and Post Bank Bakari said he has been supplying chicken to top hotels and that explained the huge transactions in his accounts. “I have a farm in Ukunda and I supply chicken to those hotels,” Bakari told the panel. Nyali Traffic Base Commander, Solomon Njuguna was accused of harassing, intimidating and soliciting money from motorists. He also failed to give explanations about M-Pesa transactions to about five people whom he said he did not know. Kavuludi’s team is targeting 598 officers from Coast, Nyanza and Western in an exercise proving to be more of a show-biz soap opera than a serious corruption eradication initiative. Some senior officers already vetted and working have been cited as regular receivers of corruption cash from junior traffic colleagues extorted at regular intervals. The Ministry of Internal Security under which the National Police Service operates faces a monumental task of transforming the corrupt Kenya Police Force into a decent service that appears opposed to change. 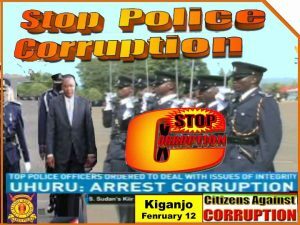 The ministry has yet to introduce anti-corruption awareness initiatives visible to both the police and the public. Interior Cabinet Secretary appears to blame the public but faced with police brutality and extortionist behaviour the general public has no option but bribe police on demand. Extortion of junior officers in the police serves pervades all formations and ranks in Kenya. There were days when Police Commissioners made as much as Ksh 500 million every month. One even commanded bank robberies and another protected drug barrons operations. The Traffic Police vetting has therefore, exposed the criminal undercurrents forcing many officers to demand bribes and shown how hollow statements by Cabinet Secretary Joseph Nkaissery are when he says members of public are to blame for bribing police. It also lays bare the current Traffic Commandant Charlton Murithi Muriuki who once served as the Director of Personnel at Police Headquarters.Having been personnel director Muriuki cannot claim ignorance of the corruption rackets and blame members of public coerced to bribe cops. Former Commandant Samuel Kimaru told Kenya Confidential that he had ran foul with Public Service Vehicles operators for turning down a proposal to visit him for a ritual of massive bribery running into millions that was shared with all key senior police officers. He also attracted administrative hierarchy disapproval for blocking such a huge tax-free income. The vetting disclosures also explain why transfers involving 380 Officers Commanding Police Stations (OCSs) were suddenly rescinded and never explained other than for confirmation that they had infiltrated the posting with corruption. It must have dawned that the transfers would adversely disrupt corruption proceeds flows and sharing. 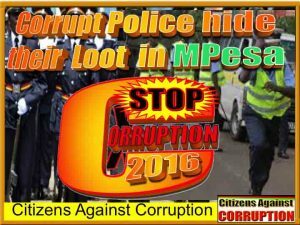 OCSs are the gatekeepers of police corruption industry countrywide. 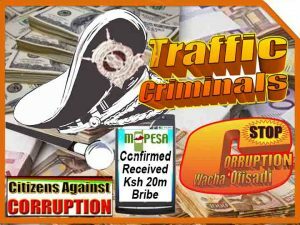 In 1998 Kenya Confidential received and published reports from Traffic Police trainees based at Karen complaining that their trainers were assigning them to return in the evening with specific amounts of money raging from Ksh 10,000 to Ksh 50,000 daily. That means officers are introduced to Highway Corruption when they go for training at Karen. When disgraced Rift Valley Provincial Police Chief (PPO) John M’mbijiwe was in Central Province he used to assign fresh inexperienced police constables Road Block duties to collect cash from motorists. He also went around the province collecting cash from base Commanders every Sunday. Those who objected to his demands would be transferred to far-flung posts with low vehicle population. One lady at Thika was such a victim who was transferred to Migori far from her children when he refused to collect bribes he used to pick at a bar in Juja town. When his corrupt behaviour was reported to then Minister for Internal Affairs George Saitoti, nothing was done. 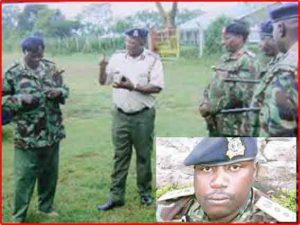 Instead he was transferred to the more lucrative Rift Valley where he met like-minded bogus policeman Waiganjo now serving term in prison while his police collaborators enjoy their plunder.